We were out in the waters of the Mitchell River, near the Indigenous community of Kowanyama. Every day we would wake at 3am ready for a 4am start of setting nets on the river. After a 7hr sampling session, we’d eat and rest and then run another sampling session in the evening, either hand-lining for freshwater whiprays (last year we had also caught a saw-less sawfish like this), or setting more nets. The first few days we were only catching small bull sharks, which is fairly stressful when gill netting. Sharks don’t do well in gill nets, but in this part of the river, which is freshwater, many of the sharks we had caught over the last three years had a fungus infection visible on their skin. This meant that we had to be even faster releasing them, otherwise they would struggle. One morning, we had caught multiple juvenile bull sharks in one net, so many in fact that we were continuously checking the net to get them all out so that we could pull the net without injuring them. When the net was finally retrieved, and we arrived back at the camp, we were greeted by a very angry couple waving paperwork at us (in the middle of nowhere) shouting that they had booked this particular camping spot where we had set up our camp. As we did not want to get in trouble with anyone, and our booking had been made by the local rangers who were on weekend break, we had to move. 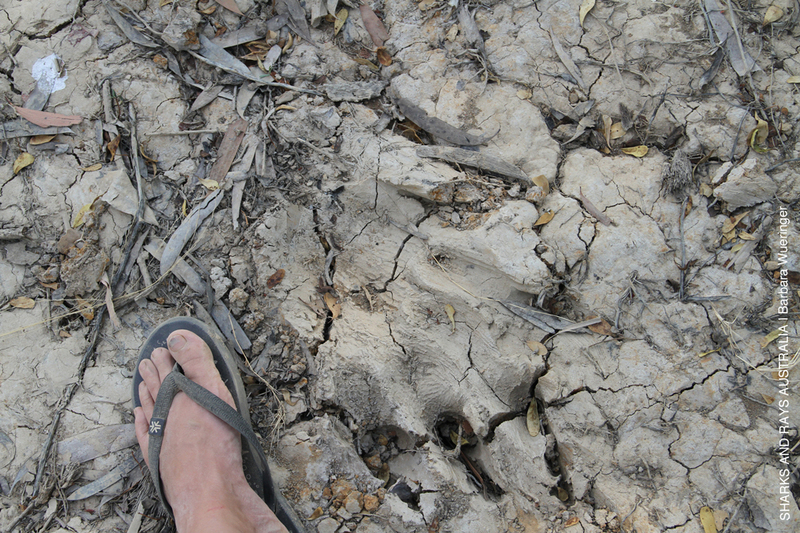 The move took about 3 hrs, and our new camping spot, the only one providing a safe entrance to our boat, also displayed a stark reminder of the presence of saltwater crocodiles. After an afternoon nap, everything changed. We all agreed that our new camping spot was better than the old one, and started over. We became friends with our neighbours. 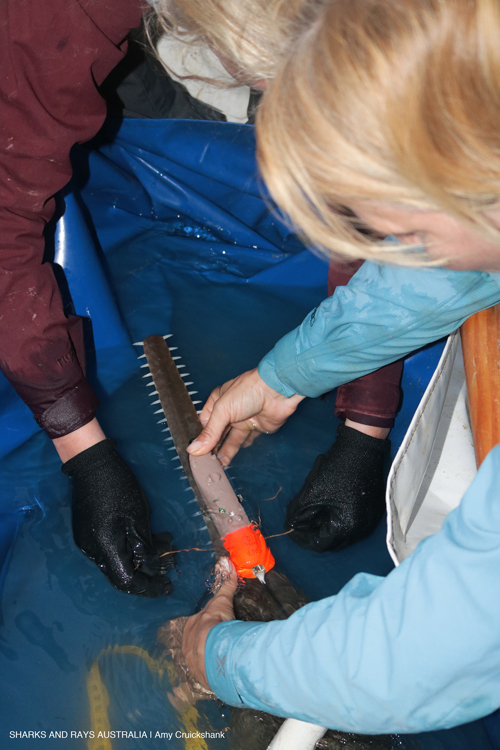 There were no more bull sharks in the net, but sawfish! And we were finally able to deploy our custom-built tags. These tags combine an accelerometer, which records the movement of the rostrum in 3D space, with temperature, light and pressure sensors, in a casing that allows the tags to be mounted on the base of a sawfishes’ rostrum. An acoustic tag allows active tracking of the animal and a VHF tag allows us to find the tag once it has detached. There are many release mechanism for tags in saltwater and they generally involve corrosion. In freshwater this does not work and so we tested our own ideas of dissolvable string. With the ‘perfect’ lab-tested configuration, the first tag detached upon release of the animal (2 mins into a 3 day deployment). We modified the set up, and the second and third tag released after about 4 hrs. The fourth tag finally stayed on. With a team of four, and three people required on the boat for tracking, it was difficult to take turns going on land, relaxing and preparing food. 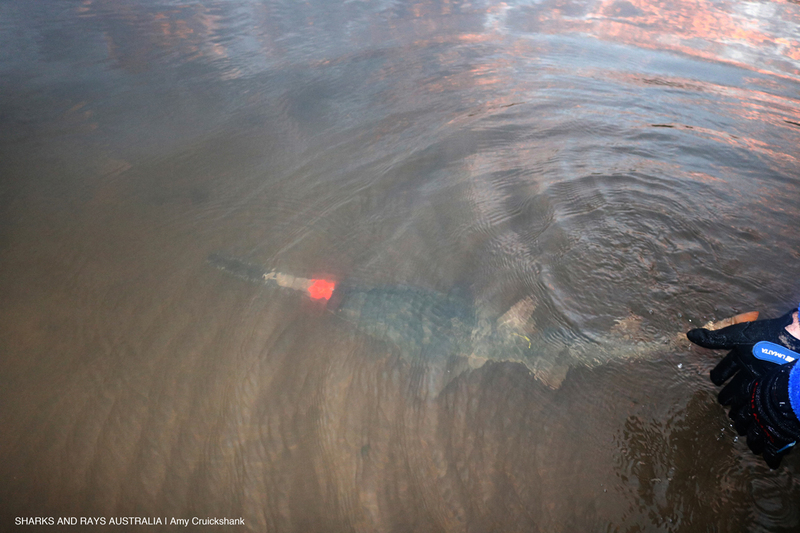 After close to 30 hrs of tracking the sawfish, with only 3 hrs of sleep, we recovered the tag. Having worked with sawfish for 13 years, this included one of my most memorable moments of fieldwork. As the tag had not been moving for a while, we decided to head to the side of the river where it was located. In order to not scare the sawfish, I beached the boat further upstream, got out and moved to the high bank under which the tag was pinging. The water was clear and I could see the little sawfish with our tag attached to its rostrum hunting baitfish. One of my field assistants was so impressed by what she had experienced on the expedition that she even ended up with a sawfish tattoo of a sawfish. Clearly these animals are not only of cultural importance to Indigenous Australians, but to all of us. Northern Australia is one of the last strongholds for largetooth sawfish and it is an important home for other endangered species too. 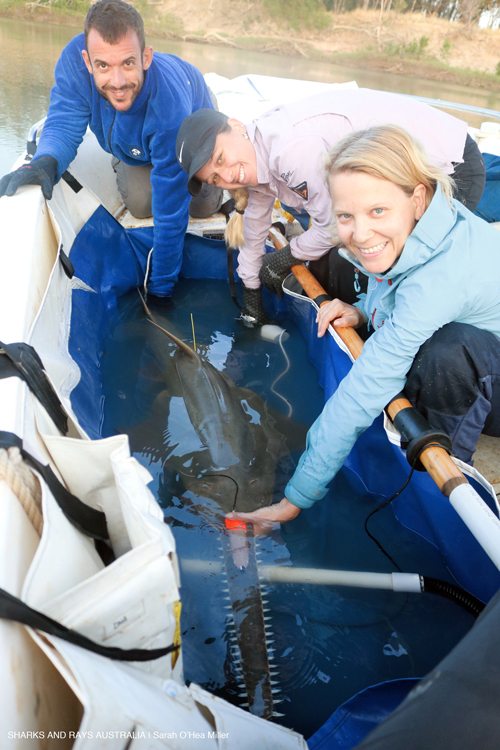 Barbara is investigating the role of sawfish within the ecosystem and working with citizen scientists to raise awareness about this critical habitat.